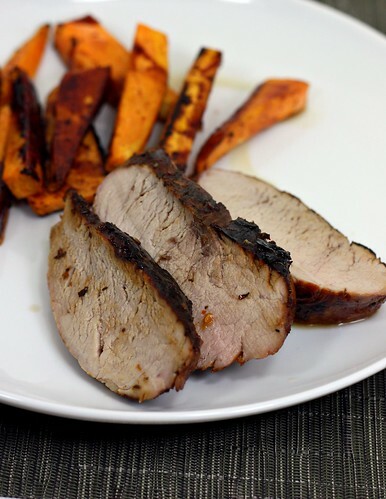 Spicy Pepper Jelly-Marinated Pork Tenderloin – Elly Says Opa! A couple months ago, my husband’s cousin was in town. We met for breakfast, and she brought me a jar of habanero pepper jelly from Seattle (from Woodring, for those of you in the know). I am a HUGE lover of peppers (um, I’m sure you already realized that) but pepper jellies have always made me turn my nose up a bit. There is absolutely no reason for this, other than my normal sweet-savory aversion when it comes to certain things. Well, that, and those popular cocktail meatballs made with pepper jelly that I’m just not into. Since I’ve always shied away from pepper jellies, I wasn’t sure what to do with this. All I could think of was either making some sort of glaze, or serving it as an appetizer/dip with some softened cream cheese. But then, I was talking to my friend Josie and she told me she had a cookbook with a pepper jelly-marinated pork recipe she’d been meaning to try. Since we have very similar tastes in food, I knew the recipe would sound good to me, too! I got around to making it last week, finally, and it was fantastic. The marinade may sound a bit strange at first glance (orange juice and red wine?) but believe me, all the ingredients work together perfectly and you’re left with a pork tenderloin that is both spicy and sweet, and a perfect balance of the two. The original recipes calls for grilling the pork, and occasionally basting it with the reserved marinade, but I cooked the pork indoors. I marinated the pork like normal, and then I seared it in a cast iron skillet, reserving the marinade. While the pork finished cooking in the oven, I brought the marinade to a boil on the stovetop, and let it boil a few minutes, and then brushed it over the cooked tenderloin at the very end. I made 1 tenderloin instead of two, but it was really big, so I ended up doing roughly 2/3 of the recipe (I’ve posted the original recipe below, so the measurements aren’t wonky). 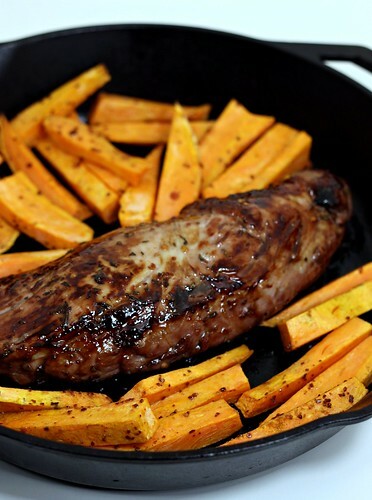 I cannot tell you how many pork tenderloin & sweet potato dishes grace my cast iron skillet. It’s perfect because tenderloin usually takes about 15 minutes in the oven while the potatoes take about 20, so you can remove the pork and let it rest while the potatoes finish cooking. And only one pot to clean. You can easily through some vegetables in here to roast too, for a complete meal, but we had this with a salad. Pat the pork dry and remove any excess fat. Whisk together the remaining ingredients, and then pour over the pork (or into a resealable bag, with the pork). Marinate at least two hours or overnight. Turn the pork several times, to distribute the marinade evenly. Remove the pork from the bag/bowl, and pour the marinade into a small saucepan. Liberally salt the tenderloin. Heat a large, heavy-bottomed skillet (preferably) over medium high heat. Once hot, add the pork and sear on all sides, about 8 minutes. Place the entire pan in the oven and cook until internal temperature reads 135-140, about 15 minutes. (If adding potatoes, slice 1-2 sweet potatoes into wedges, toss with a little canola oil and your favorite seasonings, and add the pan before sliding into the oven). Meanwhile, bring the marinade to a boil on the stove. Boil for about 5 minutes, until thickened. Brush the cooked tenderloin with the boiled marinade. Tent the pork with foil and let it rest for 5-10 minutes before slicing.